Home » india news » Mamata vs GJMM: Who will blink first in the Darjeeling stand-off? There is a full blown political confrontation underway in the Darjeeling hills. Given the All India Trinamool Congress's victory in the Mirik municipal election and its expanding influence in the hills, a nervous Gorkha Jan Mukti Morcha (GJMM) is looking to win back lost ground. While the GJMM is trying to revive the Gorkhaland issue, Chief Minister Mamata Banerjee has announced a slew of measures such as the Tenzing Norgay Bhawan to woo the hill communities. Banerjee has gone on the offensive with the GJMM announcing an indefinite strike in the hills. “They threatened me not to come to the hills. But I am not afraid of them. I went there and resolved matters. They threw bombs at us, but couldn't scare us. I feel that the the hill people must not suffer due to a few unscrupulous elements,” she said. GJMM's crisis of survival, especially with the AITC poaching several leaders like Harka Bahadur Chhettri and Santa Chhettri . Banerjee’s decision to form different boards and creation of sub-divisions like Kalimpong have resulted in the division of the hill communities. State government's decision to overhaul the administration in the hill districts and order an inquiry into the alleged irregularities in the Gorkha Territorial Administration (GTA). Role played by BJP: BJP has time and again joined hands with GJMM and assured them of the Centre's support. But it hasn't taken a proper stand on statehood for Gorkhaland. Incidentally, BJP state president Dilip Ghosh met GJMM chief Bimal Gurung a day before the agitation was launched. Senior state government officials say that another important reason for the agitation was the GJMM's need to hide their failures in completing any major infrastructure projects in the hills since the formation of the GTA in 2011. As the GTA failed to renovate roads or construct water works, the state government had to step in. CPI(M) leader Surjya Kant Mishra says that the GTA legislation itself was ambiguous as it used the words “Keeping in mind the Gorkhaland issue”. He feels this has kept the issue alive. BJP, on its part, is deriving glee from Banerjee's discomfiture. “Banerjee has failed maintain law and order in the hills. She is getting a taste of her own medicine,” Ghosh said last week. Imankalyan Lahiri, senior professor of International Relations(IR) of Jadavpur University, pointed out that “the GJMM was losing ground in the hills and they began by raising the issue of Bengali being made compulsory in state-run schools. 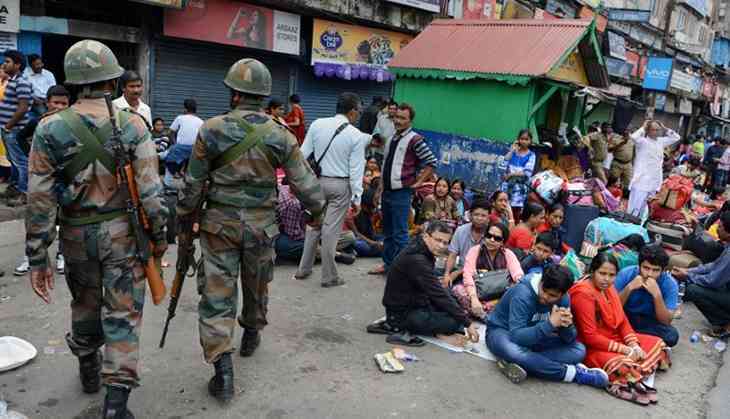 But when CM Banerjee stated that it would be optional, the GJMM decide to revive its demand for Gorkhaland state”. On Monday GJMM workers set fire to a state PWD office at Sukna and also burnt several government offices at Bijonbari and Lebong Kart Road when they saw that despite the strike, there was significant attendance at government offices. However, GJMM has denied involvement in any violent incidents. GJMM general secretary Roshan Giri said, “We have not set fire to any government offices in the hills. If we want the strike to be successful we can send our supporters to government offices (to enforce it)”. However till last reports, around 10 GJMM supporters were arrested in connection with burning state government offices in the hills. CPI(M)'s Mishra has said that Banerjee's divide and rule policy has contributed to the crisis and he urged her to convene an all party meeting on the issue. In another development that may of concern to the GJMM, the framing of charges in the Madan Tamang murder case are expected to begin on Tuesday. Tamang, a leader of the Akhil Bharatiya Gorkha League, was allegedly hacked to death by GJMM activists in 2010. According to political analyst Amol Mukherjee, this is a stand-off between the AITC government's efforts to expand political and administratively into the GJMM's domain and the latter's attempts to keep the Gorkhaland issue alive.